As I wrote in an earlier post, Facebook has a huge opportunity to bring group buying to the masses. At the time I wrote the article, exact details concerning Facebook Deals were not released, yet the potential of a group-buying platform on Facebook could not be ignored. Today, Facebook Deals launched in 5 cities, offering more specific details – let’s examine why the Facebook Deals platform will be the future of group buying. Facebook has incorporated a huge amount of social sharing capability, utilizing the “Like”, “Share”, and “Post to Profile” functionality. 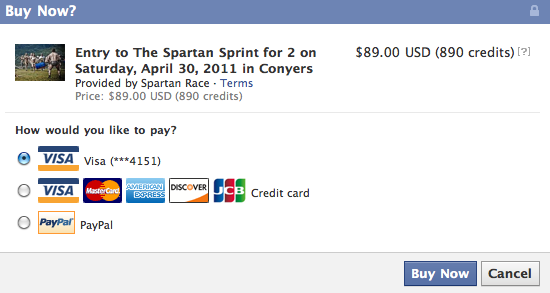 Facebook understands that they can destroy Groupon and LivingSocial with their social sharing capability. Sharing is seamless on Facebook – users will be more likely to share these deals with friends, simply because they are already on the platform. Compare that to other group-buying websites, which encourage subscribers to share the deal on a different platform (Facebook, Twitter, Email). Notice the “Share” and “Like” buttons above. The share button allows users to send the deals as a message, while the like button will enable users to share the deal on their newsfeed. 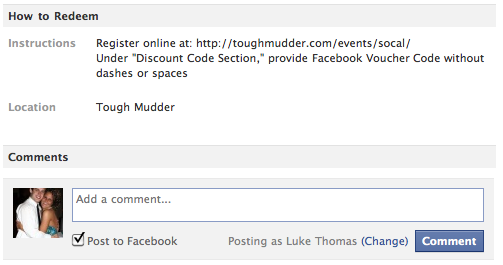 Notice also if I decided to comment on the deal, Facebook automatically enables the “Post to Facebook” button. Many skeptics believe Facebook will never be a hub for e-commerce, but what about social-commerce? I have the ability to share my purchase with my Facebook friends – it’s almost like posting a receipt on your Facebook newsfeed – that’s SOCIAL! 3. Will Facebook Monetize Deals? YES! What business in their right mind would pass up an opportunity at a multi-billion dollar market? Groupon made $2 Billion dollars last year on group deals. 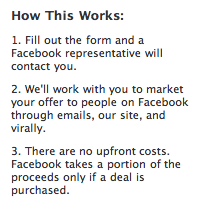 The only proof I found was this screenshot below, which explains that Facebook will take a portion of proceeds only if a deal is purchased. What do you think? 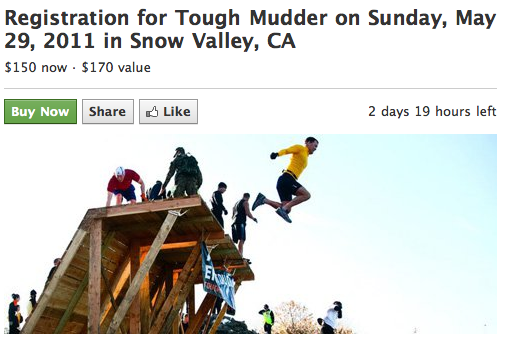 Will Facebook Deals gain enormous traction, or will Groupon and LivingSocial reign supreme? Previous post Do College Students Deserve Unpaid Internships?